Benefits agencies, not to mention most employers and social landlords, now require claims and applications to be submitted on-line. This can be difficult for people in supported accommodation, but Union House Accommodation Services (UHAS) committed to placing Internet access in its Union House supported housing unit by installing wi-fi access points in the communal areas. Union House, a former District Nurses’ Home, was built at the turn of the 20th century and as you would expect running 21st century data cables and ensuring perfect wi-fi coverage in a three story, solid brick building with iron reinforced floors was a challenge. However, detailed planning and a prior wi-fi coverage survey meant that installation in the building took less than 1 day with minimum disruption to the everyday running of the building. DrayTek Vigor AP-910c wi-fi access points were selected as they provide a high specification, professional access point with a vast array of security and management features to protect the users from unauthorised access and when coupled with DrayTek’s Web Content Filtering they provide a secure web browsing experience. 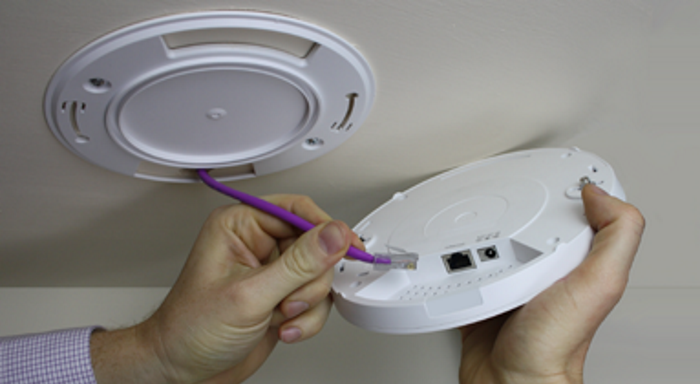 Ceiling mounting the wi-fi access points means that they provide unobstructed coverage to the areas around them and they aesthetically blend into their environment thanks to their shape, size and hidden cable entry. Now all of the residents can apply on-line safely and securely for benefits, jobs and housing using their own smartphones or PCs supplied by UHAS.